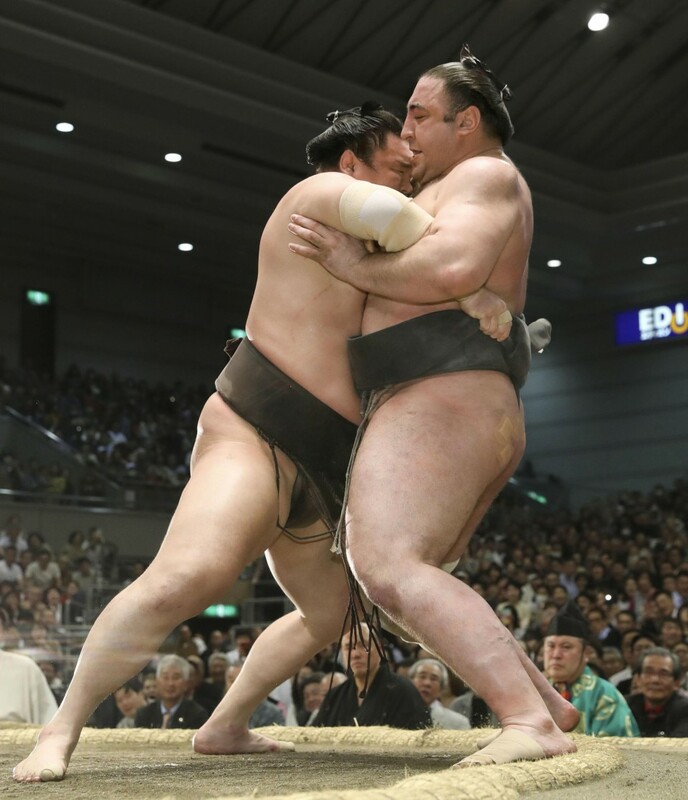 Grand champion Hakuho beat ozeki Tochinoshin on Wednesday to retain his lead at the Spring Grand Sumo Tournament with 12 straight wins. Hakuho faced little challenge from the struggling Tochinoshin (6-6), who has only beaten the 41-time top-division champion once in 28 matchups. The Mongolian yokozuna hemmed up Tochinoshin after a momentary stalemate, then turned on the gas after recharging his engine and deposited the ozeki over the straw. Fighting as a demotion-threatened "kadoban" ozeki, Tochinoshin needs to secure two wins over the final three days of the 15-day meet to retain his post at sumo's second highest rank. The final bout of the day at Edion Arena Osaka proved to be an upset, with ozeki Takayasu (10-2) defeating yokozuna Kakuryu (9-3). With both wrestlers looking for their 10th win, Kakuryu fought back to gain the inside edge against the ozeki and planted himself in the center of the ring. But Takayasu found the grand champion's belt, and hefted Kakuryu over the edge before falling out himself. 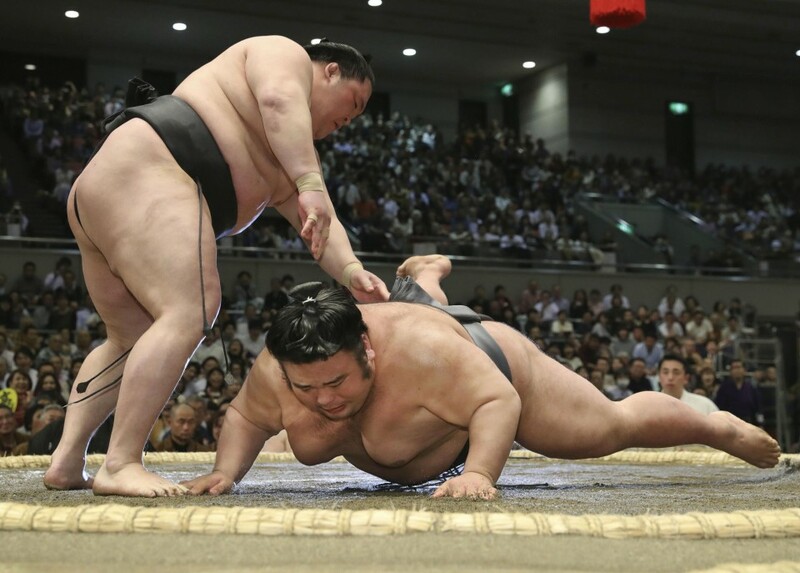 Takayasu improved to 9-12 in his rivalry with the yokozuna. Rank-and-filer Ichinojo (11-1) remained the only wrestler one win behind Hakuho after defeating No. 8 Asanoyama (7-5). The No. 4 maegashira promptly secured a left-handed grip on Asanoyama's belt as the wrestlers collided, then swung the 170-kilogram wrestler around to the edge of the ring. With his opponent backed into a corner, the massive Mongolian swung his right arm over Asanoyama's head for extra leverage and threw him down to the clay. The sekiwake wrestlers, who won respective titles at the previous two tournaments, had mixed fates on Day 12. Tamawashi (5-7), meanwhile, defeated top-ranked maegashira Endo (4-8). After a heated exchange of slaps, Tamawashi was driven to the edge but reversed on the straw and dashed out of harm's way. The Mongolian turned and put everything into a flying shove to launch Endo off the raised ring. Newly-promoted Hokutofuji (4-8) bounced back after posting a losing record on Day 11 by taking down No. 3 Nishikigi (3-9). Hokutofuji created some distance with a hard initial shove, then bulldozed the maegashira out. Among the lower ranked wrestlers, Bulgarian-born Aoiyama and former ozeki Kotoshogiku each improved to 10-2 with wins against Ryuden (8-4) and Chiyotairyu (6-6), respectively.